Ah, what a country. Only in America. First we have the Secretary of State of the United States, Rex Tillerson calling president Donald Trump a "f'n moron". Then we have the president coming back to suggest an IQ test between himself and Tillerson [and he "knows who would win"]. Just think if Tillerson took up the president on his offer; it would be the IQ test challenge of the century [maybe of all eternity]. In this corner, we have the 'little man' from Texas. 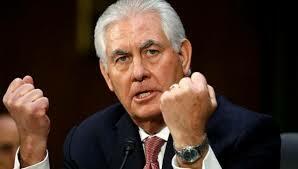 The soft spoken, never calls names [except when talking about his boss], Rex "Tyrannosaurus" Tillerson! In this corner, we have the big man with little hands from New York. 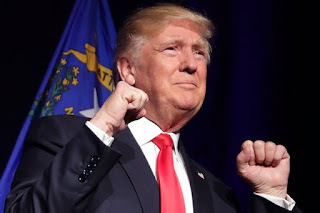 The loud spoken, who never does not call names, Donald "MAGA" Trump! This is a new IQ test developed from the Tales law firm, Dewey, Cheatem, and Howe. It is a 3 question test that each contestant has 5 minutes to complete. They do not get to call a friend or ask the audience's help. Here are the 3 questions, gentlemen. 1. Who assassinated president John F. Kennedy? 2. Which one of the following hurricanes was referred to by the president of the United States as, [I've been told] This is the biggest, has never happened before, may never happen again, hurricane? 3. Which of the following presidential candidates in 2016 thought that president Bill Clinton should not have been impeached, but rather president George W. Bush, should have been impeached? Good luck, gentleman, your time begins now.....and may the best mind win. Im thinking DT flunks this IQ test!